Treatment for arthritis and fibromyalgia currently consists of managing the symptoms, as the causes have yet to be fully understood. In this enlightening guide the author, Dr. Bruce Fife, projects his theory that both conditions are related to an underlying infection. His research has led him through a maze of possible viruses, fungi, and bacteria, and he expresses his belief that the culprit lies within infected teeth and gums. Did you know that a tooth and socket comprise a joint? From the teeth, bacteria easily enter the bloodstream, causing secondary infections in the joints. One’s mind might leap to the conclusion, if it’s an infection then give me antibiotics. Just like life, it’s not that simple. If the secondary joint infection is caused by virus or fungi; antibiotics are useless. Well-researched facts are presented to us in the beginning of the book, leading up to Dr Fife’s Arthritis Battle Plan. He warns us that some drugs i.e., non-steroidal and anti-inflammatory drugs, may reduce inflammation but may have the high price of accelerated bone destruction. Dr Fife fascinates the reader by presenting the extraordinary healing power of coconut oil. It seems the oil is comparable to natures own, mother’s milk. Both have properties, when broken down by the body, become antimicrobial. Unlike synthetic antibiotics, this more natural agent is not harmful to our body’s ‘good bacteria.’ In effect, coconut oil reduces systemic infection, thereby reducing infection in the joints. The importance of proper diet is not ignored, and he stresses his opinion of the impact on health by refined sugar and grains. The Magic of Motion chapter addresses the need for weight bearing, yet low-impact exercise. Teaching us that although rest is important, inactivity will, in effect, ‘rust’ our joints. Lightening the amount of weight we put upon our joints is essential. The book is completed with a summary of his Seven Steps to Beating Arthritis and Fibromyalgia. This is a drug-free lifestyle, which he claims will not only eliminate pain but rebuild joint function, restoring mobility. Be adventurous and attempt his Seven-Day Whole Foods Challenge. The book leaves little doubt to its validity including index, numerous references, diagrams, and endorsements from several satisfied followers. Dr Fife has shared his knowledge in many other books promoting healthier choices, if nothing else a sense of hope. Finishing my own further investigation, I intend to put coconut oil on my grocery list, adding it to my own attempt at relief, by living a healthier lifestyle. Watch out pharmaceutical companies, perhaps nature has provided the real cure. Highly recommended! 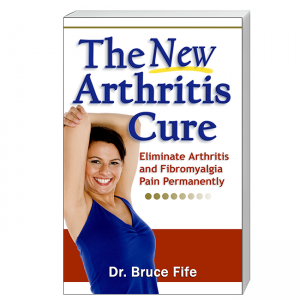 Click here to learn more about The New Arthritis Cure.